Have you heard of the organisation Home Start? They’ve been described by a client of theirs as, ‘armbands in deep water’, because they offer a lifeline to parents who feel overwhelmed and in desperate need of support, reassurance and friendship. I caught up with them to find out more. For those who are not familiar with Home Start, please give us an overview of the amazing work that you do. The South Yorkshire scheme was set up 35 years ago and has supported an average of 250 families a year. We recruit and train over 100 volunteers a year and match them with families at home to offer them informal, friendly and confidential support. Volunteer training prepares our volunteers for supporting families who may be experiencing any number of issues: domestic abuse, parents struggling with isolation or bereavement, parents juggling with the pressure of a multiple birth, illness or disability as well as those who are simply need a friend. As well as receiving the rewarding satisfaction of helping a parent grow in confidence- strengthening their relationship with their children and widening their links with the local community, volunteers can gain vital experience to help with career prospects like childcare or midwifery. Home-Start provides 2 main services; home-visiting and family outreach groups. Home-Visiting is when a volunteer is paired with a family and visits once a week for a few hours. They are there to provide informal, friendly and practical help. Family outreach groups across South Yorkshire allow parents to interact with other parents in a friendly environment. There are many toys so children and babies have the freedom of playing and it allows parents to feel at ease and speak to others who are going through similar situations; a way to tackle isolation and post natal depression! Do you have any events coming up where people can find out more about your services? 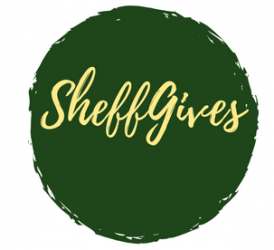 How can SheffGives followers get involved and lend their support? We are always looking for new volunteers who can help a family in need. If you are a parent yourself, have experience with children, are able to complete a short 6 week training course and can commit to supporting a family for only 2/3 hours a week, then you could make a real difference! And finally, what is the best thing about working for Home Start? When speaking to volunteers of Home-Start they all agree that volunteering for the charity is very rewarding as you not only give but get something in return. It is a nice feeling to know you have put your own experiences as a parent to help other families in need and it makes you feel good about yourself. Home-Start makes volunteers feel confident about themselves and gives them the skills to progress in a job they want. What our volunteers say – Volunteering is a great way to give something back and also get something for yourself. There are ongoing courses so you can keep learning new things. It is very rewarding to help someone else, to know that you’ve made a big difference to a family. It is good experience to get into work It gets your confidence back- gets computing skills back up to scratch so it is a confidence booster. You use your parenting skills to help others so it feels good like your years haven’t been wasted and you’ve learnt a lot that you can offer to other parents. There are new courses all the time so all sorts to learn for new skills so if you want to go back to work, you’ve got these skills. A message of thanks to Home-Start – Home-Start was invaluable to me. When I needed someone to support me they were there. I have gone from someone who needed help to someone who offers help which shows how good the service is. You can really turn things around with Home-Start. For people who need volunteers to become volunteers shows what a good charity it is. Volunteering is enjoyable and I love doing it. You meet such lovely people and it has been a real pleasure. I am very happy in Sheffield which wouldn’t have happened without Home-Starts support.